Brooklyn’s South Slope neighborhood welcomes Camperdown Elm, the debut project from Chef Brad Willits and owner Nao Minami. The restaurant draws its name from a famous elm tree, which is situated nearby Prospect Park. 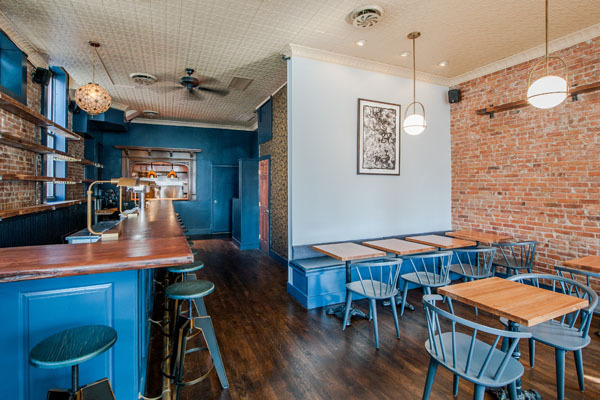 Camperdown Elm will serve seasonal and approachable New American fare. The menu is broken out into Snacks, Smaller Plates, Mains, and Sweets. 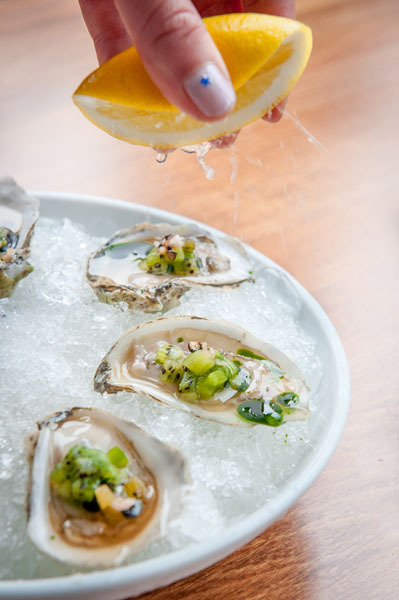 The snack menu features Grilled Cucumbers with Ikura roe, chili, and smoked buttermilk and Squid Crackers with Mackerel paté and benne seed, as well as, Oysters with seasonal mignonette to enjoy in the summer months. 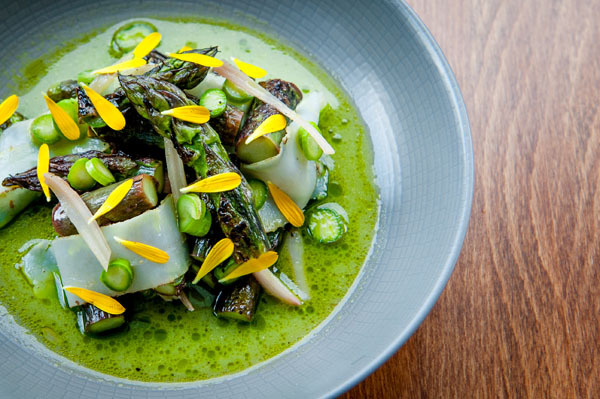 The restaurant’s small plates offer a wide variety of options, from Charred Mackerel with Avocado, Cucumber, and Dill to Asparagus with Sunflower Miso and Lardo. 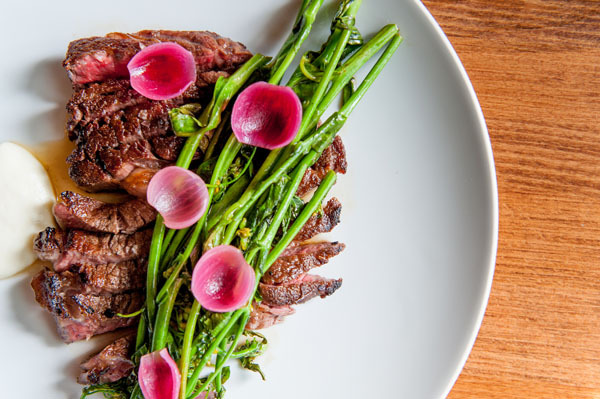 As for the larger plates, stand out menu items include the Lamb with carrots, skyr, farro, and pine nuts; Arctic Char with potato salad, mustard seed, and lovage; and Beef with brassicas, and Camperdown steak sauce. 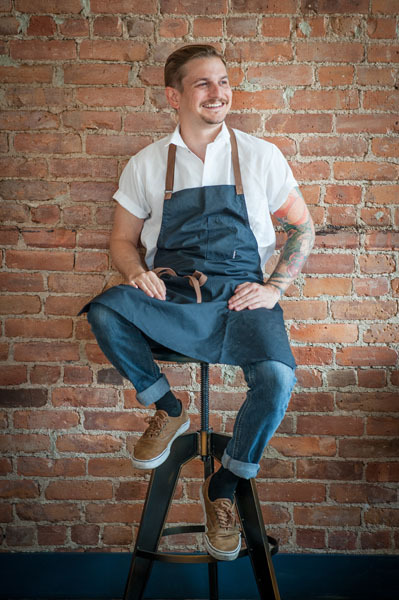 The dessert menu will feature an ode to Florida cuisine with a “Key Lime Pie” which is made with sea buckthorn, as well as Chocolate espresso coriander with dulce de leche and strawberries with anise hyssop, meringue, and pistachio. Through the use of seasonal ingredients, minimal waste, and other sustainable practices, the prices throughout the menu maintain their affordability. The beverage program at Camperdown Elm offers wines by the glass and the bottle, with a list consisting of 60 wines from all over the world. The selection will showcase natural wines as well as dynamic options from eclectic producers that pair well with the seasonality of the menu at affordable prices. The beer selection features a mix of local craft breweries as well as Florida favorites from Brad’s roots, including Tampa’s Cigar City. The bar offers 8 beers on tap and a handful by the bottle and can. Michael Groth the designer of the interior of the restaurant adds subtle nods to the moniker, which are present throughout the restaurant with reclaimed wood accents, including the bar top which is a salvaged thick-cut yellow pine beams (from a former bakery in Williamsburg). 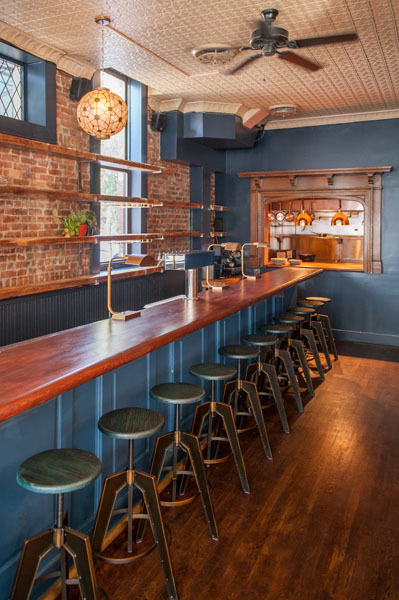 The tabletops are also wooden butcher blocks; the bar shelves are made from reclaimed beams from a New Jersey factory, and an original 1909 fire mantle from from Knox Hall at Columbia University frames the restaurant’s kitchen pass. Photographer Richard Rethemeyer prominently displays one major piece of artwork, which features Prospect Park’s Camperdown Elm tree. The photo is developed in a Platinum format with a unique depth to it, and will, theoretically, last forever. The 60-seat restaurant includes 26 seats in the dining room, outdoor dining for 20, and 14 seats at the bar. With its proximity to the park, Camperdown Elm will be incorporating many environmental and sustainable practices, including their promotion of unfiltered New York City tap water. When guests order tap water, glass bottles will display the lab results of the EPA certified water in addition to some messaging about what they are drinking. If guests choose to buy bottled water instead, all proceeds will be donated to The Water Project, a non-profit organization that delivers safe, clean water to those without access.